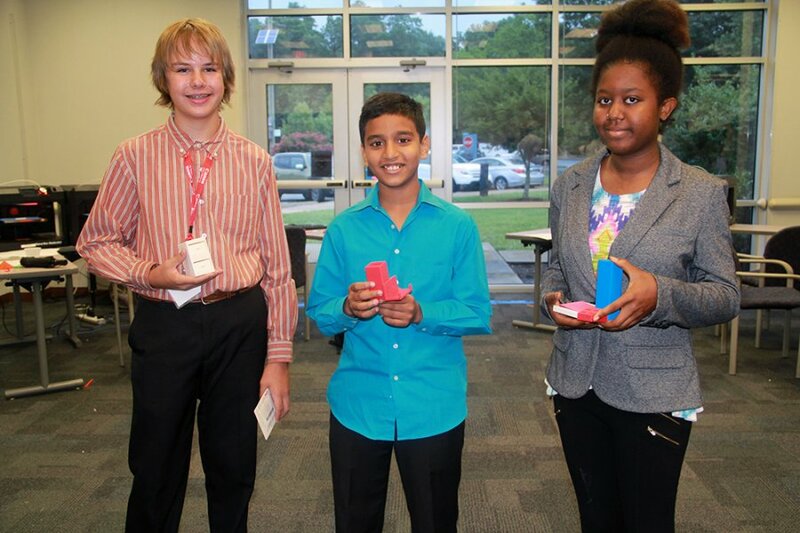 caption: MOAHA, a group of four young innovators, was represented by Dawson Struck, of Tabb High School; Bharath Kashyap, of Grafton Middle School; and Monae Frazier, of Warhill High School. The students earned $100 gift cards each. Today, what works for some does not necessarily work for all; customizable products have remained popular based on their ability to give everyone the perfect product to fit individual needs. For the judges at the 2016 Imagineering! & Creative summer camp the customizability of MOAHA’s office organization products was unforgettable. MOAHA, a group of four young innovators, was represented by Bharath Kashyap, of Grafton Middle School; Monae Frazier, of Warhill High School; and Dawson Struck, of Tabb High School. The students earned $100 gift cards each at the finale of Imagineering! held at the Peninsula Workforce Development Center. The competition was the culmination of the weeklong Imagineering! Camp that focuses on advanced technological skills, including in-depth CAD programs and 3D printing machines, and entrepreneurial skills needed to fund a product from concept to design to marketing and sales. Students presented to a Gator Tank panel of judges, which included Daniel Morris, executive director of the Peninsula Technology Incubator; Carr Lewis, welding engineer at Liebherr Mining; Dave Creamer, retired principle at New Horizons Education Center; Jon Calma, director of nuclear refueling at Newport News Shipbuilding and Charlene Clark, co-owner of Signature Canvas Makers and The Bay Scene. The group of 20 students made up four different groups that presented products that the judges and audience; which included family, friends and supporters from NASA LaRC, Newport News Shipbuilding and more, could see themselves use everyday. The final manufacturing camp of the summer, the Hover Games, will be held August 1-6. In it’s second year, the camp will offer students an opportunity to build, program, and fly quadcopters.